SiteGround vs. DreamHost Comparison (2019)- 1 Clear Winner! Home » Hosting Reviews » Hosting Comparisons » SiteGround vs. DreamHost Comparison (2019)- 1 Clear Winner! Are you wondering which is a better hosting option: SiteGround or DreamHost? They’re 2 of the most popular web hosting companies out there. But one has to be better than the other, right? In our UNBIASED comparison between SiteGround and DreamHost, we’ll help you figure out the best choice for your budget and needs. Both SiteGround and DreamHost have a lot in common. For example, both hosting providers are officially recommended by WordPress.org. Both of them offer different WordPress-centric hosting solutions, like managed WordPress hosting and WooCommerce hosting. SiteGround is one of the few hosting companies that allow users to choose their preferred data center when signing up for a hosting service. They provide 30-day money back guarantee to try their service, risk-free. DreamHost was founded in 1996, and currently hosts around 1.5 million domains. They offer industry-leading 97-day money back guarantee to try their service risk-free. Speed and uptime are the most important factors you need to consider when choosing a web hosting service. Both SiteGround and DreamHost boast about their super fast server performance and high availability. We decided to put their promises on a test to see whether their servers actually live up to the hype. To analyze the performance of hosting servers, we signed up with both hosting providers and built a WordPress website on each of them. To mirror a live environment, we also installed a default WordPress theme, added dummy content, and uploaded some images. Then we conducted a few different speed tests on each of the hosting server with the following testing tools. According to Pingdom speed test tool, our SiteGround test site took 649 ms to load when tested from Dallas, Texas. That’s faster than 95% of all tested sites. On the other hand, our DreamHost test site took only 445 ms to load, which’s faster than 97% of all tested sites. After our Pingdom test, we tested the sites with Load Impact to see how these servers handle a traffic surge during peak load time. From the chart, you can see that there were some spikes when there were around 50 users at a time. That means the website slowed down for a few moments, and then it reverted after a few seconds. However, DreamHost performed consistently throughout the test. The number of live visitors on the site doesn’t have an impact on performance. We also tested the sites with Bitcatcha to see how these sites perform in different geographical locations. We recorded the page loading time from eight different global locations: New York, LA, London, Brazil, India, Singapore, Japan, and Australia. According to Bitcatcha, our SiteGround test site was rated C whereas the DreamHost site was rated A+. 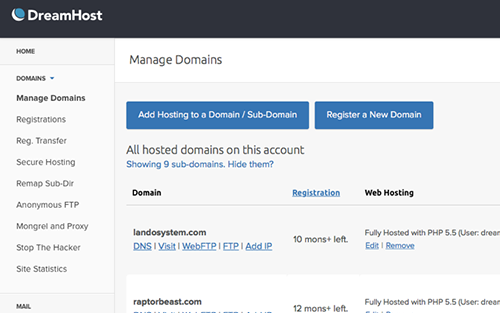 While all SiteGround plans come with cPanel to manage your web hosting account, DreamHost provides a custom web-based control panel which is developed in-house. DreamHost control panel is intuitive. However, if you’re accustomed to using cPanel, the industry’s most popular web hosting control panel, then there’ll be a bit of learning curve to tackle before using the DreamHost interface. 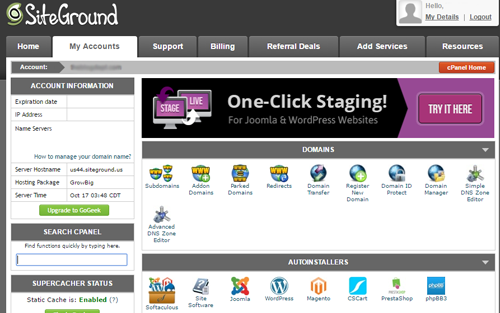 Both SiteGround and DreamHost offer 1-click installer to quickly launch your preferred website scripts, like WordPress, Joomla, and Drupal. Both SiteGround and DreamHost run the gamut of hosting options from cheap hosting, WordPress hosting all the way up to dedicated servers. Let’s take a look at few areas where SiteGround excels in comparison to DreamHost. Geeky features: Get geeky features with their GoGeek shared hosting plan such as, easy git integration, 1-click staging environment, backups on demand, PCI compliant servers, etc. Choice of data center: Choose from 3 different data center when signing up for your hosting plan. High performance: SiteGround provides unmatched WordPress performance with their unique caching options. Now that we’ve looked at some of the advantages of SiteGround, it’s time to examine a few areas where DreamHost excels in comparison to SiteGround. 97-day money back guarantee: DreamHost beats the pants of all their competition with their industry leading 97-day money back guarantee. More hosting options: DreamHost offers more WordPress-centric hosting options, including WordPress hosting, managed WordPress hosting, and WooCommerce hosting. Unlike SiteGround, DreamHost offers VPS hosting as well. Automatic WordPress updates: DreamHost offers automatic updates, so you can have a peace of mind knowing your hosting is in safe hands. By comparison, we believe SiteGround offers more number of advanced hosting features thanks to their Geeky features and unique caching options. SiteGround offers 24/7 customer support via live chat, email, and phone. They have an extensive documentation that helps uses walk through every aspect of building a site with SiteGround. DreamHost only offers support via live chat during 5am – 10pm PST, 7 days a week. Although call back requests are available, you’ll have to subscribe to it separately either by making a one-off payment or purchasing a monthly subscription. Let’s take a look at a head-to-head comparison between SiteGround and DreamHost. SiteGround $3.95 /mo. $3.95 /mo. $42/ year $80.00 / mo. $269.00 / mo. DreamHost offers huge discount on their introductory plans to first-time users. By comparison, DreamHost plans are cheaper than that of SiteGround. After our comparison, we believe SiteGround is a better hosting choice than DreamHost. One of the main drawbacks of DreamHost is their customer support. DreamHost doesn’t offer 24/7 live chat support. That means, if you’re in a different time zone, then resolving your hosting issues could be a hassle. Even worse, phone support is not offered for free. On the other hand, SiteGround comes with all essential features you need to get your site up and running. We hope this article helped you find the best hosting service. For more details, check out our SiteGround review and DreamHost review.